You have already a specific name in mind you want to call your horse? Let us change the horses registration to the name you prefer and transfer the papers into your name. You found the horse you love, but the horse needs more hours? We train the horse for you till you feel comfortable. Do you live far away or don't have a trailer available? I will make sure that your horse comes safe to your place, with stops in between for long distances. If your are interested in any of these services please contact for availability and details. We charge an average rate of $1.5 per km. 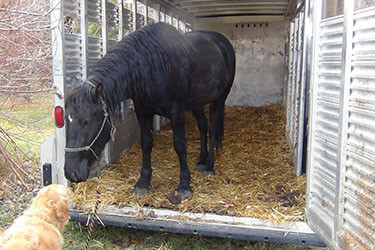 If you wish for us to transport your new horse you can be given an exact rate before transport. During transport the horse is well fed and watered during stops. Horses can either be tied or free roaming throughout our stock trailer. We can haul up to 6 horses, depending on size. Weanlings and yearlings we can fit about 8. For long distances we can make a few stops in between. 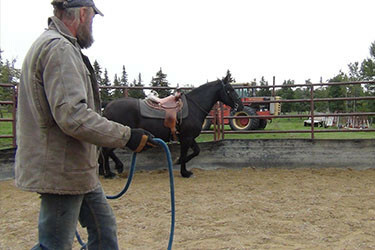 We like to stop about every 3-4 hours for the horse to have a bit of relax time and we do a full body over veiw to make sure they are handling the trailing ok. All of our horses are given a trailering lesson prior to leaving to ensure that if you ever wish to take them somewhere they are easy to handle and transport. Our training is based on Ray Hunt methods and natural horsemanship by giving the horse the time it needs to become a reliable and well-mannered horse on the ground and in the saddle. Most of our horses, given basic training can be reliable even for beginner riders. Depending on our time frame, we can train your horse for $ 1000 Dollars + Board. Please contact for details. 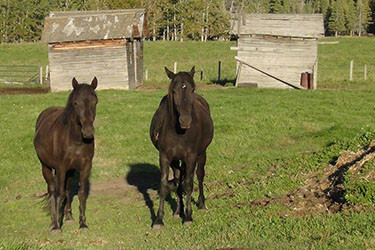 We have three different, purbred Canadian Horse stallions to choose to breed your mare to. They are well handled, friendly and gentle to mares. All three stallions give something a little different to our breeding. Eros has a longer back and is fairly tall, and very well put together. Revy, our 13 year old stallion has a more compact confirmation, producing some very lovely driving and mountain horses, although has produced some lovely eventing horses bred to the right mare. Finally, our newest stallion: Beaumont, a very well bred, long legged colt brought all the way from Ontario. 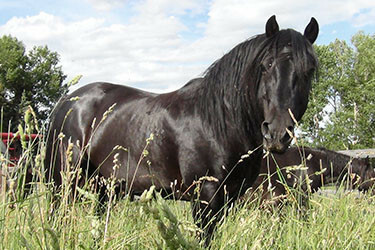 Pick a mare and a stallion in which you would like a foal from. A deposit will hold the foal in utero and up until weaning. You can visit your baby almost anytime and watch him/her grow up. The filly or colt will be handled after birth to ensure friendliness. If you want we halterbrake and do the first trim. Additionally, you can choose the horses name and we can do the registration for you. The full amount must be paid prior to the foal leaving for his new home. 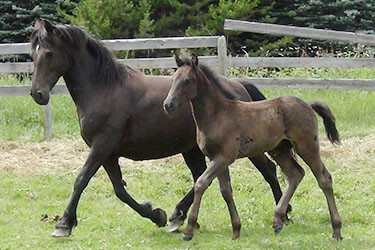 If the foal is not quite what you expected the mare can be rebred or another foal can be chosen. Pick up the colt or filly after it is weaned. Big pasture till you can bring your horse home or permanent horse pasture. Use our cow pasture for trail rides, go to the river and use our round pen and arena. Your horses can be kept with ours or seperate (for $250 Dollars). 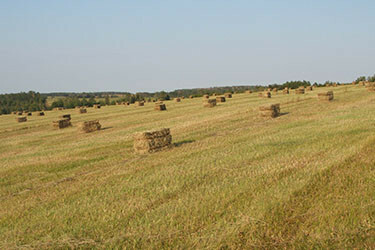 We offer high quality horse hay, in either square or round bales. We can deliver for the price of fuel and time.